Description The Wedgwood factory gave Susannah Margaretta (Daisy) Makeig-Jones (1881-1945) her own design studio in 1915. Drawing on her early love of fairy stories, she introduced an imaginative line of decorative wares that remained popular throughout the 1920s. This particular design was introduced in 1924. 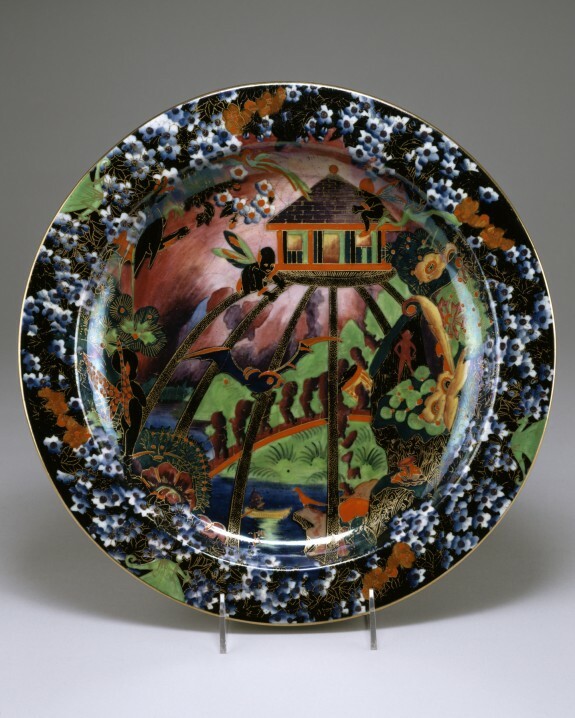 Engravers transferred Makeig-Jones's designs to copper plates for printing onto paper sheets known as pottery tissues. While the ink was still wet on the pottery tissues, the images were rubbed onto the ceramic surfaces. Women painters then applied the colors to these designs on the ceramics, a process that necessitated several firings, and then added the colorful glazes. The gold details were added last. Provenance Lev Kaplan, New York; Mrs. Arthur J. Gutman, Baltimore; Walters Art Museum, 2002, by gift. 13 in. (33.02 cm) (diam.) approx.